Kidlington Parish Council has forced Cherwell District Council to reconsider its decision to approve the proposed development of 52 flats on the Co-op car park site. There is still therefore hope that a much better scheme for this important site can be agreed. Cherwell’s planning committee had approved the proposal on 4th August by the slimmest of margins despite opposition from the parish council and the many objections which we all made to the scheme. The proposal also contravened policies in Cherwell’s local plan and went against its own design advice. It would have been contrary to the draft Kidlington Masterplan and previous design studies for the village centre. It needed the Chair’s casting vote to get the proposal through even though all the substantive comments from committee members had been against. Unfortunately, and partly due to the timing of the meeting in the holiday season, not all Kidlington committee members were present or represented. However Kidlington members Alan MacKenzie-Wintle and Maurice Billington spoke strongly against. Alan Graham also opposed the proposal on behalf of the Parish Council. Fortunately, the formal notice of approval has not yet been issued (because a legal agreement has to be made with the developer). This has given the Parish Council the opportunity to challenge the decision. Its legal advisors wrote to Cherwell arguing that the decision making process had been flawed because of a failure to take account of its own policies and other important matters. Cherwell has clearly seen the strength of the Parish Council’s argument and on 20th October replied to say that it would respond to KPC’s concerns and would not issue a decision notice on the application before it had been reconsidered by the Planning Committee. At the moment, we don’t know when Cherwell is likely to reconsider the scheme. Its planning committee could still approve it. However, it does give an opportunity to ensure that all eligible Kidlington councillors are present to vote and it may provide us another opportunity to express our strong concerns in advance of the meeting. We should also press for the draft Kidlington Masterplan to be approved by the Council as soon as possible, as this supports the case against the development. We hope that the Cherwell will, this time, turn down this poor proposal and work with the Co-op to achieve something much better for Kidlington which will make a positive improvement to the centre of the village. There is a lot at stake - we will probably lose a lot of parking ! 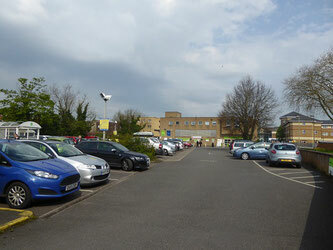 To lose the long established footpaths that cross the coop car park is unacceptable. Try to imagine a four storey block of unbroken flats filling this massive space in the village centre.